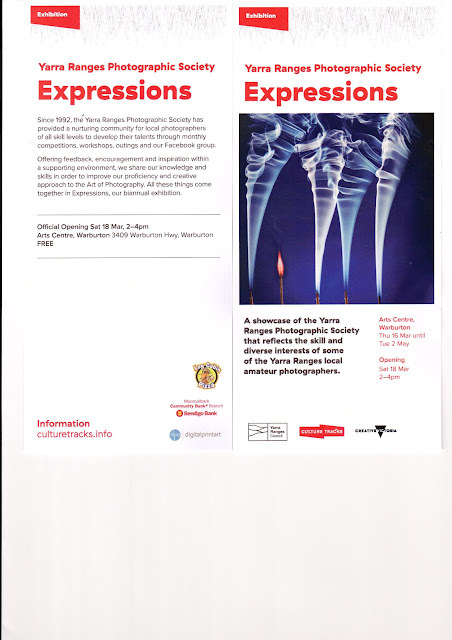 Yarra Ranges Photographic Society photographic exhibition. 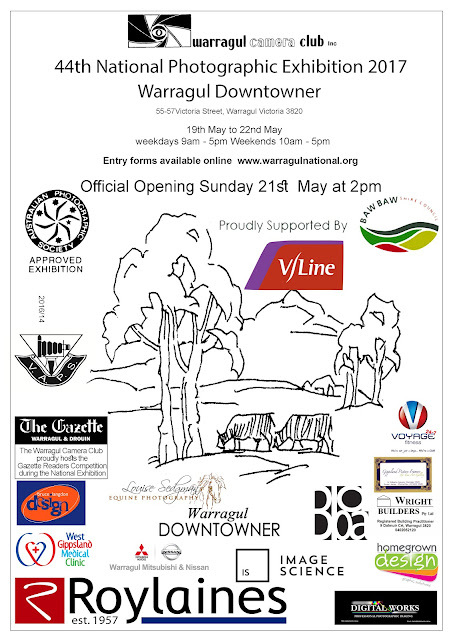 Yarra Ranges Photographic Society advises it is holding it's biennial photographic exhibition shortly. The offiical opening is this Saturday, from 2 pm – 4 pm but the exhibition runs from Thursday 16th March to Tuesday 2nd May. General meeting of the Yea Camera Club Inc. held Wednesday 8th March in the RSL room. Divide the picture into 4 and have something interesting in each. Vanishing point for lines. Strong lines can disappear outside the shot. A good professional knows what the shot is before picking up the camera. Location research is 90% of the job. See everything before you shoot anything. It’s all about the light – golden 20 minutes! Camera gear – Outstanding optics and good sensor plus a tripod. This year, this concept will replace our homework. Over the year the aim is to produce six pieces of our very best work which can be entered into our Melbourne Cup competition, be displayed in our January display and also be ready for the assessment process for the VAPS Inter Club competition. The monthly topics will be aligned as far as possible with the monthly presentations. Your submission can be a print presented at the next meeting or a digital sent to Alan Cole and the concept is that it will then be positively reviewed by the members present. Hopefully suggestions will enable you to improve the image so that the final result is as good as you can make it. This month’s topics are Landscape or Flora/fauna. Ann Potts reported on the visit to the Blue Lotus Farm outing. Kerry announced that as a result of a pre poll of members, the club will run a competition and display over the Melbourne Cup weekend. A call was made for interested members to join the committee to organise and Ann Anstey, Ann and Andrew Potts, and Phil Glowacki and Gidget Knight volunteered. Joy and John Clayton will steer the committee. Ballarat International.19/20 August This weekend in August coincides with AFL in Ballarat and interested members were advised to book their accommodation ASAP. Photo judging. As previously announced on the night, the Peer winner for February “Rounds” was Ann Anstey and Phil Glowacki. The judge’s choice was Kerry Gouldthorpe, with Highly Commended Joy and merit Ann A.
Michael alerted members to a Photo Exhibition at the NGV from now until August. Kerry asked for volunteers to photograph the Harvest Festival next Wednesday 10.30 – 2.00pm. Ann Potts and Michael volunteered. Kerry alerted members to the UGLN photo competition. Check the web page or facebook for details. Next meeting of the midweek clubbers will be Tuesday 14th @ 9.30 meeting at Cummins Reserve. Louise here from the Warragul Camera Club. Its that time of year again for the Warragul National photographic Exhibition. Yay! It would be AMAZING if you could please forward this email on to your club members with the attached entry form and poster along with a second entry form for a special little competition/exhibition on trains that we are running in conjunction with our National. V/Line are one of our great new gold sponsors so we wanted to show our support! You might also notice our special club award sponsored by another of our Gold sponsors, Roylaines, for the 'most print acceptances'. This is a fantastic new $300 award your club could potentially win, so help us spread the word and encourage your members to enter for a chance to win some $$$. Thanks for reading and for sharing, we look forward to receiving your club members entries soon. Just a reminder.....ENTRIES CLOSE WED 5th APRIL, so don't miss out, ENTER NOW. Go to www.warragulnational.org for details and entering!!!! The Upper Goulburn Landcare Network Photography Competition is back again! Click here to go to entry form and details lapge. This year we are very excited to have The Yea and District Community Bank as our partner, sponsoring the prize money. Judging of the entries will be completed by to members of the Yea Camera Club.